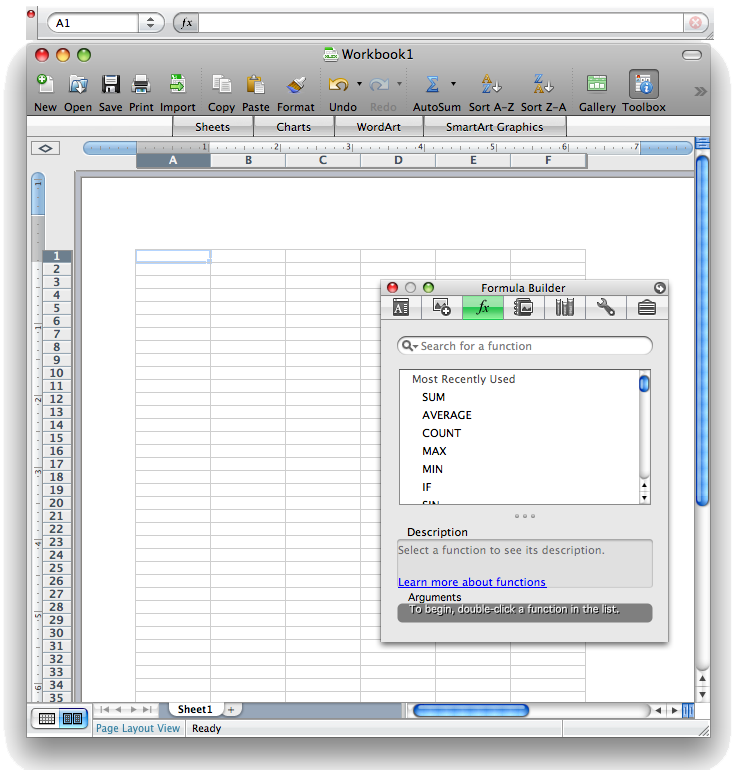 Like Word 2008, the new version of Excel rids itself of the floating standard toolbar and instead incorporates toolbars into the document window itself. 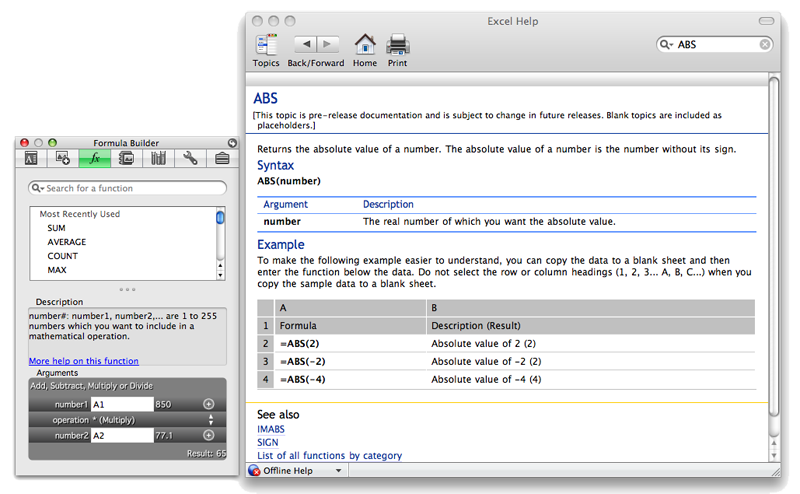 However, when you open the Formula Builder (now incorporated into the Formatting Palette where Citations are in the new Word), the Excel document window moves down and a floating formula window appears (below). Why is the formula bar a floating window rather than being incorporated directly into the window itself? This design requires a lot of round tripping with the mouse. The formula bar is also built into the palette, although it's presented in a brushed metal looking interface (below) that doesn't seem very scalable for complex formulae. The Formula Builder lists all of its functions in a flat listing, with a short list of recently used items and a search feature for finding the function you're after. 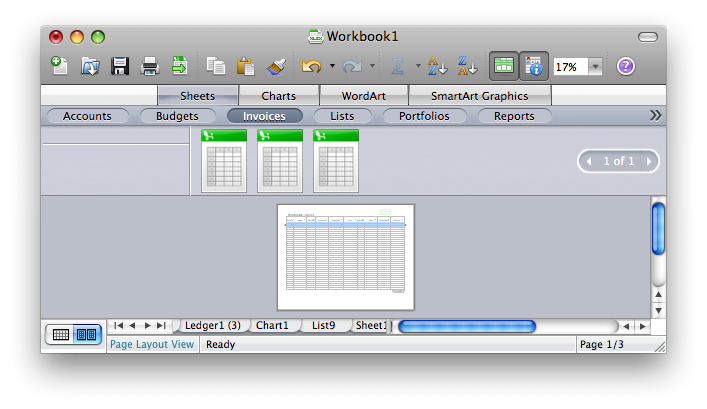 For doing what it is best at, the tools as presented by Excel 2008 seem clumsy. 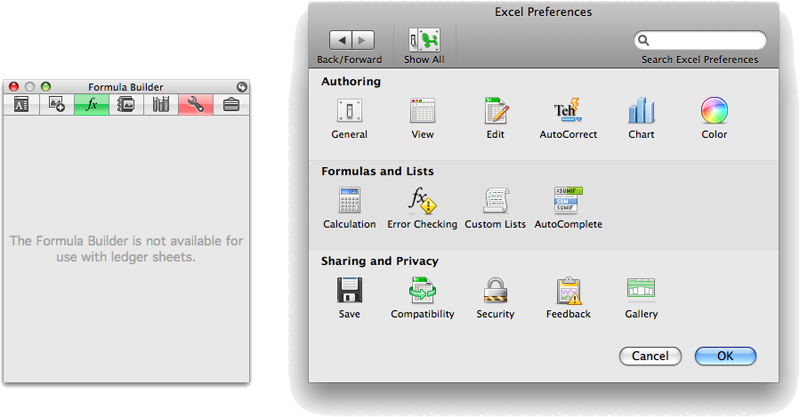 Integrated within the Formatting Palette next to the Formula Builder is the Compatibility Report tool (below left), formerly buried in behind the Toolbox icon. Anytime you enter or create anything that is not supported in previous versions of Excel, this blinks in red to notify you that there may be a compatibility problem. Fortunately, this behavior can be turned off in preferences (below right), which are presented in Office in an interface similar to System Preferences. 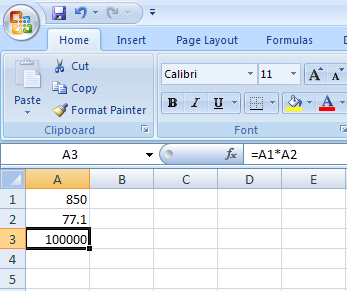 In contrast, Numbers presents a formula bar integrated in the document window itself (above), just as Excel has always appeared on Windows (below, Excel 2007 running on Vista). 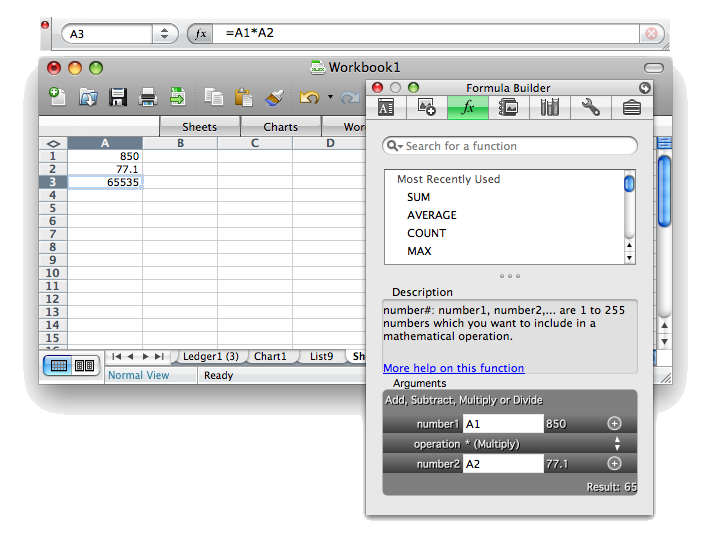 Excel's function list in the Formula Builder links to help pages that describe how each function works (below). Using the fx button in its formula bar, Numbers presents a function lookup panel in a more accessible format than Excel (below). 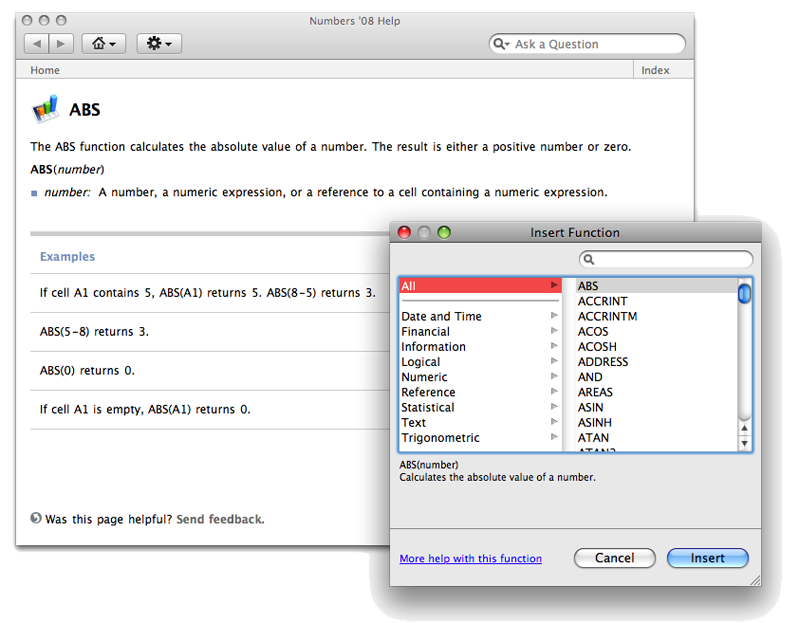 Numbers uses the standard Mac OS X help window for defining functions, and provides notes that are easier to understand. Numbers offers fewer functions overall than Excel. 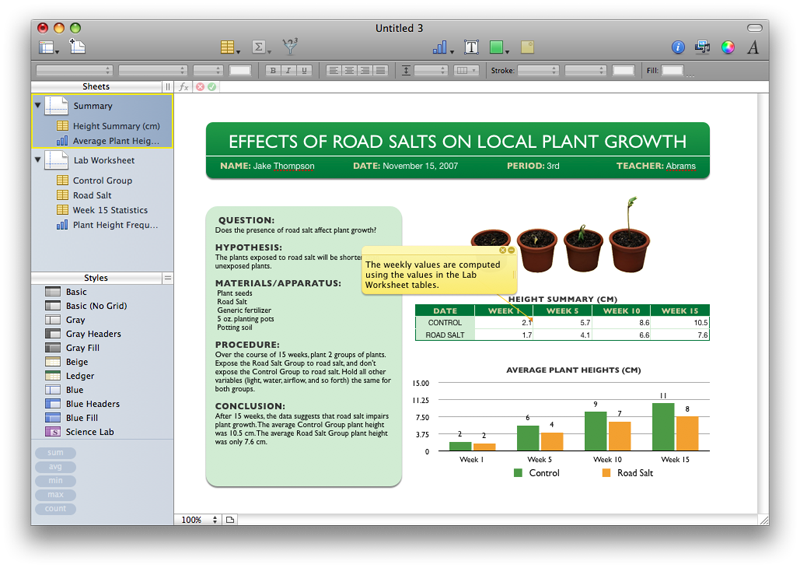 In his review of iWork, Walt Mossberg of the New York Times wrote "For real spreadsheet jockeys, however, Numbers is wimpier than Excel. 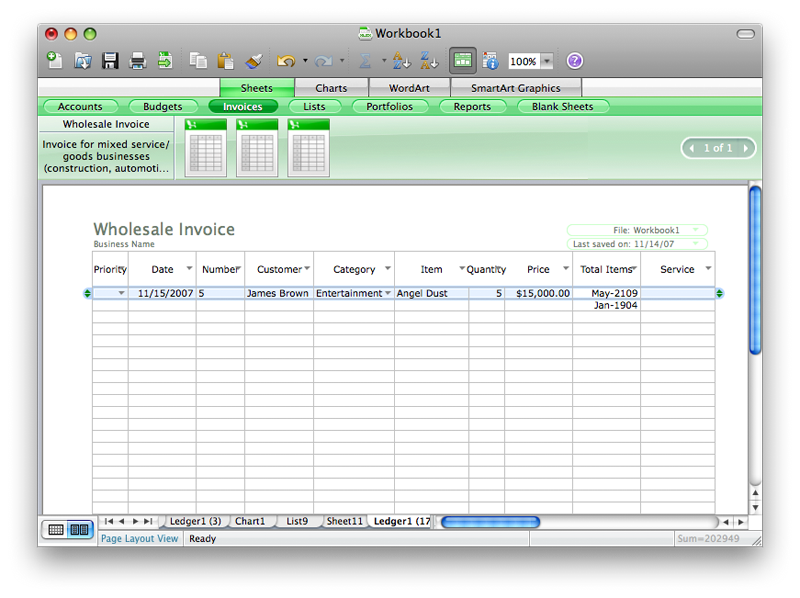 It has only about half as many functions for making calculations and doesnt do pivot tables." While pivot table functionality is a weak point of Numbers, counting its included functions isn't necessarily a good measure of its general capabilities. Although the 169 functions of Numbers is close to half of the 327 functions in Excel, Numbers supplies the same text, logical, date and time, and math functions as Excel, apart from functions pertaining to array and matrices. The real weaknesses in Numbers' function count come in financial and statistical functions, and Numbers 1.0 offers no engineering or database functions at all, as Curmi outlines in Functions in Excel and Numbers. For its target audience, Numbers covers most of the functions users would encounter in opening spreadsheets from Excel users. It would be smart for Apple to open up Number's functions with a plugin architecture that allows third parties to develop their own functions in areas where the program is lacking; this would also help in enhancing compatibility between the Numbers and Excel. While templates are offered within the Project Gallery, users might find them easier to discover from the Elements Gallery (below top). 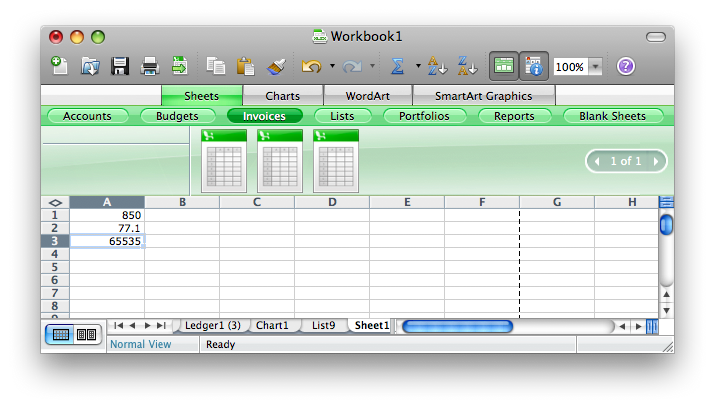 In Excel, the Gallery is bright green, in order to distinguish it from the blue in Word. If you find the candy colors overbearing, you can set the Gallery to use graphite grey in preferences (below bottom). There are also settings to adjust the translucency of the Gallery and turn off the bouncy magnify effect of the Gallery icons. 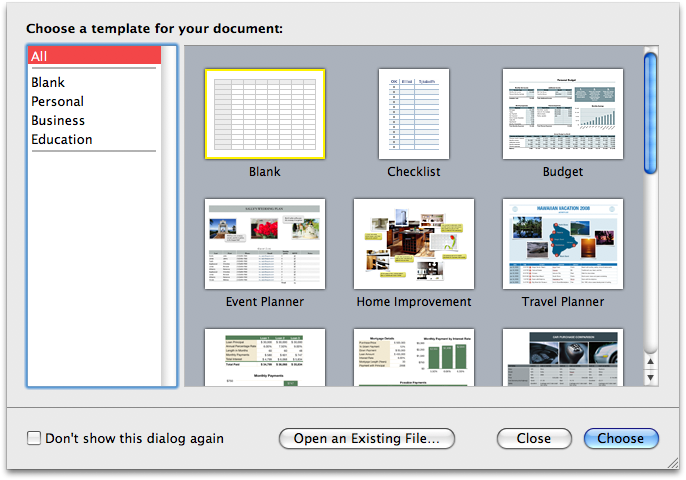 Excel 2008 for Mac makes an effort to present ready to use templates similar to Numbers, but falls short of really delivering very practical templates. In Excel, the first tooth in the Gallery dentures is Sheets; it presents a variety of templates related to accounts, budgets, invoices, lists, portfolios, and reports. The templates themselves are all extremely simplistic. For example, there are six accounts ledger sheets that are nearly identical: a generic account balance ledger, one for a checking account, a business checking account, a savings account, etc. The other headings offer similar simplistic lists, and the ones I worked with seemed to be problematic in some of their calculated fields. If you can figure out how to make use of these templates, you probably could have set them up yourself with minimal effort. All of the templates appear to just be various list sheets, as if somebody had a free hour and ran through the list manager repeatedly creating some placeholder templates under different names. There's nothing in them that seems to make them accessible in any particular way; instead, it seems like many of them just serve to perpetuate examples of poor ways to use Excel, such as building a standalone shopping list or an expense report. Why not either just use a notepad or something with real expense reporting features such as Quicken? In Numbers, the user starts with a series of graphical templates (below) which present ideas for how the program can be used, and actually serve as practical starting points for typical projects. Considering that Numbers is targeted toward consumers, it would be great if Apple offered additional professionally designed templates for it or sponsored a community for developing and sharing templates. Unlike iWork or the new Mail 3.0 templates, it is easy to create Numbers templates from your own documents using the Save as Template command (below). 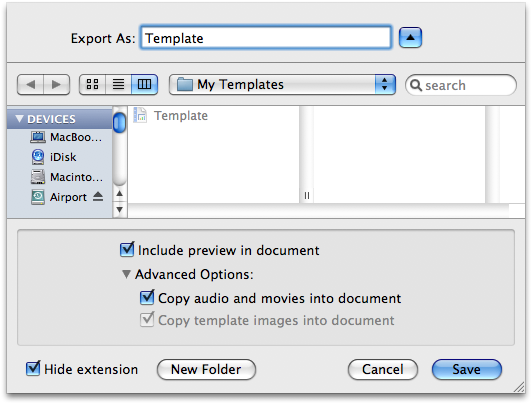 Saved templates appear in a My Templates section in the template chooser (above). 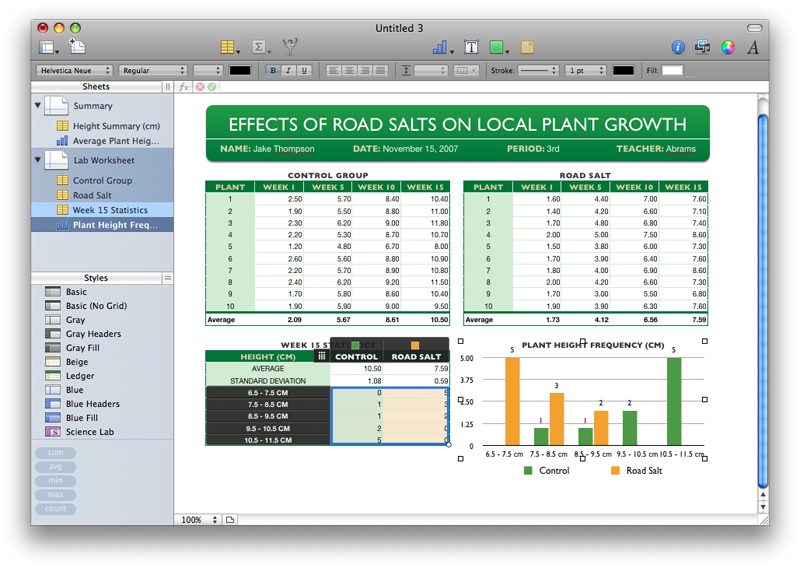 The template's Lab Worksheet (below) shows off how a chart can be created from a table, and how both can be presented attractively on a sheet ready for printing. The chart on this sheet is selected, which highlights the data it is based upon in the adjacent table of statistics. 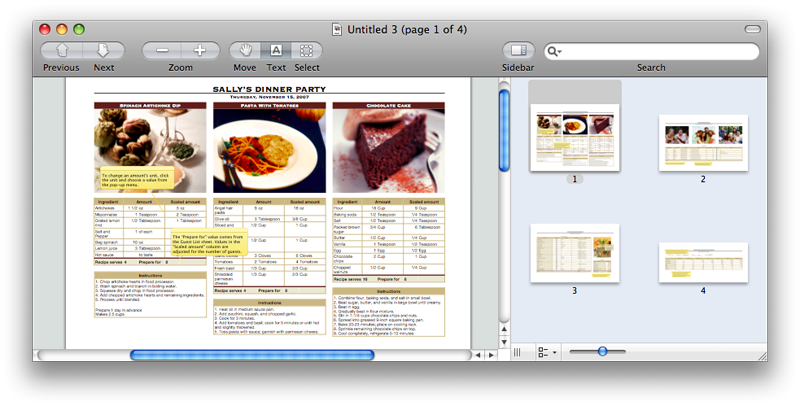 The Dinner Party template includes a sheet of recipes, a guest list that can be populated from Address Book, a shopping list checklist that ties into a simple budget, and a conversion table of cooking measurements. The sheets all connect together in that the recipes draw preparation numbers from "invitation accepted" parties in the guest list, and use that number to calculate quantities of supplies needed in the shopping list by referencing the conversion tables. A Team Organization template includes various sheets including a team roster, player statistics, a games schedule, a graphical field positions and playoff bracket presentation, and a budget. 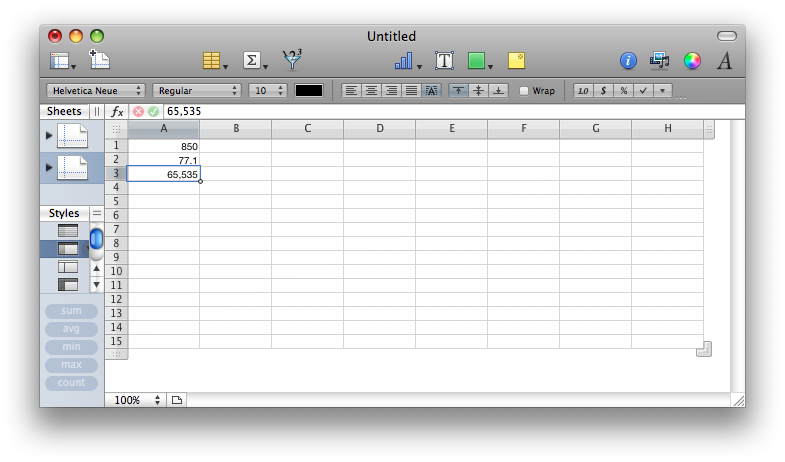 On page 3 of 3: Excel Charting and Excel vs Numbers.